Is it finally safe to buy the dip? ... while Nasdaq 100 futures are 1.8% higher with Tesla gaining 11% in pre-market after smashing expectations and helping to brighten the mood, following a similar rebound in Europe which initially fell 1% in early trade, but has since rebounded and the Stoxx Europe 600 was up 0.3% with Italian and Spanish stocks leading the European recovery, the FTSE MIB up as much as 1.4% and the IBEX up 1.3%, helped by a rebound in the beaten-down tech and auto sectors following reassuring results from Peugeot. After hitting 26 yesterday, the VIX fell over 2 points to 23.16 and suddenly the market looks to be turning the corner on yesterday's brutal selloff. Earlier in the session, Asia-Pac bourses saw hefty selling as the stock market bloodbath rolled over from the US, with the MSCI Asia Pac sliding into a bear market overnight. Australia's ASX 200 (-2.8%) and Japan's Nikkei 225 (-3.7%) slumped from the open amid heavy pressure in tech and with losses in Japan magnified by a firmer currency, sending Japan’s Topix index to the lowest in more than a year while corporate updates failed to provide any reprieve as Sharp shares slumped following a cut in its revenue forecasts. 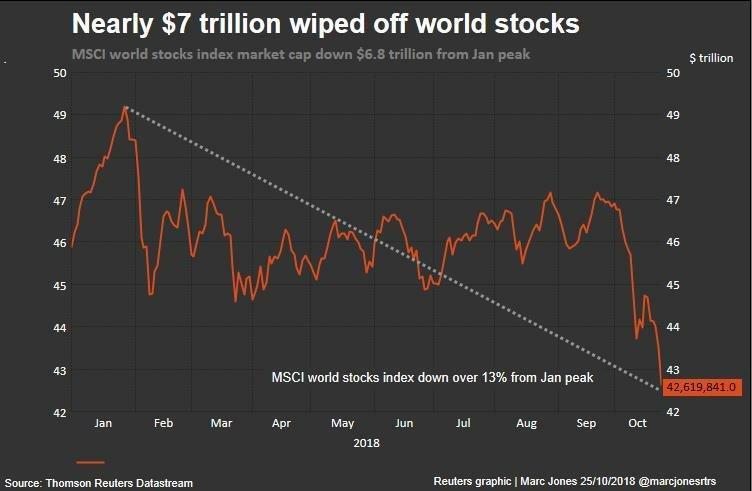 Asia's overnight woes have seen the global wipeout on the MSCI World since January near $7 trillion. Pan Asia-Pacific shares skidded more than 2% while Japan's Nikkei tumbled as much as 4% to a six-month low. However an early sign that a rebound was in the offing came from China's Shanghai Composite, which pared losses of as much as 2.8% as the National Team made its usual late-day appearance, helping stocks close just barely in the green and providing a base for sentiment. While China's rebound was certainly helped by Beijing, an odd hiccup was observed in the offshore Yuan, which suddenly tumbled after the European open, then cratered to the lowest level in years as the USDCNH spiked as high as 6.9669 before retracing most of the bizarre move. There was no news to explain the spike or subsequent fade. So is this the bottom at last? To be sure, all signs are positive for the time being, but there's the case of North American trading to navigate, and another barrage of earnings; we could very well get a deja vu repeat of Wednesday's session, when heading into yesterday's session risk sentiment recovered as well but that quickly faded later on and US stocks endured a bloodbath instead. 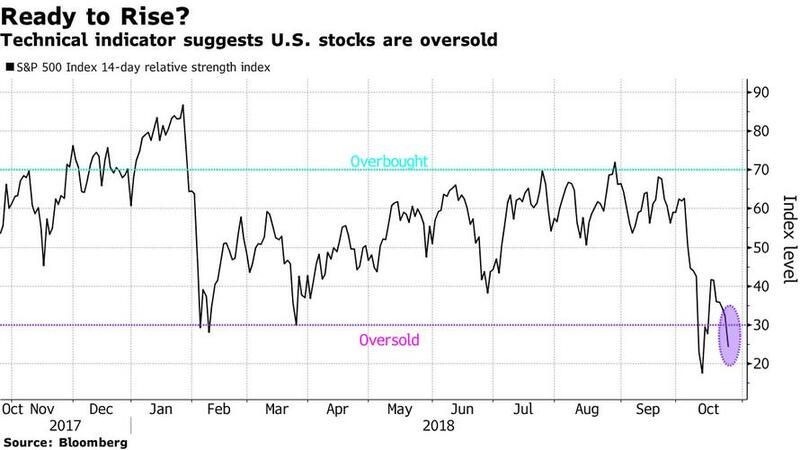 That said, US stocks are now more oversold than they were at the trough of the February crash. Additionally, investors remain apprehensive as a flood of earnings, while mostly stellar, have come with warnings about the future impact of tariffs and rising costs. Central banks are also in the spotlight, with investors speculating what if any impact the market uncertainty will have on policy decisions. Currency dealers were also cautiously reversing out of Swiss franc and Japanese yen safety trades and Italian and Spanish bonds made ground as traders waited to see what message the ECB delivers at its meeting later. Most economists expect ECB President Mario Draghi to say the bank will stick to plans to end stimulus this year. But it will be the signal he sends about market volatility and concerns around Italy, his homeland, that could be most crucial. Ahead of the ECB meeting - where as previewed last night the outlook for the euro-zone economy will be scrutinized - US Treasuries declined and European bonds were mixed; the German yield curve meanders around unchanged levels ahead of the ECB with 10Y yields steady ~0.40%. Importantly, the Bund/BTP spread is 7bp tighter, as BTP futures rise despite official denials of possible budget adjustments. Other peripheral spreads similarly tighter, semi-core yields little changed. It wasn’t just the ECB that was being closely watched either. Turkey, which has been stabilizing in recent weeks having been at the center of emerging market troubles was also holding a central bank meeting. The consensus is that having almost doubled its interest rates already this year to 24 percent, it might be brave enough to hold still this month. Looking at FX, major currencies traded in relatively tight ranges as stocks rebounded in Europe with the ECB press conference looming. The Bloomberg Dollar Spot Index consolidated after reaching the highest level in 16 months yesterday while the overnight risk rally put the yen and the Swiss franc on the back foot. Bank of Canada’s hawkish stance supported the loonie another day, as the Canadian dollar tested 55-DMA resistance versus the greenback, and oil consolidated recent losses. Norway’s central bank retained its careful approach in raising rates and the krone met modest support. Emerging-market currencies stayed under pressure while euro-area bonds advanced and Treasuries edged lower together with the yuan. In G-10, NZD is the worst performer after New Zealand trade deficit hit a record. WTI stages a small bounce off Asian lows back up to $66.70. Base metals little changed. placed a November oil order from Iran due to concerns over how the sanctions will impact their global operation. Looking ahead, it's going to be a big day for earnings with American Airlines, CME Group, Comcast, Conoco, Merck & Co., Twitter, Union Pacific, Alphabet, Amazon, Intel and Snap are among many companies due to report earnings. Expected data include wholesale inventories, durable goods orders, and jobless claims. Asia-Pac bourses saw hefty selling as the stock market bloodbath rolled over from US where the S&P 500 and DJIA turned negative YTD, while the Nasdaq posted its worst performance since 2011 and slipped into correction territory amid an aggressive sell-off in tech. As such, ASX 200 (-2.8%) and Nikkei 225 (-3.7%) slumped from the open amid heavy pressure in tech and with losses in Japan magnified by a firmer currency, while corporate updates failed to provide any reprieve as Sharp shares slumped following a cut in its revenue forecasts. Shanghai Comp. (Unch) closed little changed and Hang Seng (-1.2%) saw firm losses with Cathay Pacific shares descending on reports of a data breach that could affect around 9.4mln passengers, although losses in the mainland were to a somewhat lesser extent amid further liquidity efforts by the PBoC and continued supportive rhetoric by Chinese agencies. Finally, 10yr JGBs were higher as they tracked upside in T-notes and with demand underpinned as the stock sell-off spurred a flight to quality. European equities mostly higher despite the mass sell-off experienced overnight in Asia after the soured sentiment from US spilled over onto the region. Eurostoxx 50 (+0.9%) resurfaced after opening in the red while the SMI (-0.4%) failed to take advantage of the rebound as the index is pressured by shares in ABB (-3.0%) and Lonza (-1.7%) amid weak earnings. On the flip side, CAC (+1.4%) is buoyed as 75% of the index is in the green (with the top gainers fuelled by earnings), and Spain’s IBEX (+1.3%) is lifted by banking names after Bankinter (+1.5%) reported inspiring earnings. In terms of sectors, telecom names lag along with healthcare while consumer discretionary and materials outperform. Moving onto individual movers, WPP (-18.0%) rests at the foot of the Stoxx 600 after cutting guidance, dragging Publicis (-5.0%) shares lower in sympathy, while AB InBev (-9.0%) shares are also trading with hefty losses amid disappointing earnings across all metrics. broadly flat DXY which remains contained by its recent 96.00 to 96.50 range. European markets await updates from the ECB with EUR/USD contained by offers around 1.1420-25 with analysts also flagging 1.1bln in option expiries for the pair between 1.1420-30. Focus for the ECB release today will likely centre around the Bank’s view on risks to the Eurozone’s economic outlook and whether risks will continue to be viewed as ‘balanced’ or ‘tilted to the downside’; expectations for any material adjustments to the ECB’s forward guidance are relatively low. Elsewhere, GBP has seen little in the way of material price action as GBP/USD straddles the 1.2900 handle (note, 627mln expiry Friday) as political jitters keep any potential moves to the upside contained for now with Lloyds touting the possibility that daily momentum suggest the pair could extend recent losses towards 1.2800. May appears to have survived any potential catastrophic fallout from yesterday’s 1922 Committee meeting but intra-party tensions remain a threat to the Brexit process. Focus during Asia-Pac trade continues to focus on the seemingly one-way moves in USD/CNY with CNY posting its weakest close vs. USD since Jan 3rd 2017. Commentary continuing to speculate over what action (if any the PBoC) will take against defending the 7.00 barrier with this week’s measures taken by policymakers unable to reassure markets against the threat of trade conflict from the US. Elsewhere for Asia-Pac currencies, USD/JPY managed to reclaim 112.00 to the upside overnight with some suggestions of selling fatigue, that said, the current stock market rout could lead any optimism to be relatively short-lived; UBS recommends selling rallies between 112.25-35. Notable option expiries for USD/JPY includes 1.3bln at 112.00-10, 815mln at 111.75-85 and 1.7bln at 112.50-60. In commodities, gold is trading flat just above USD 1230/oz, following the overnight equity sell off in Asia, where the yellow metal rose to session highs of as investor sought a safe haven, but has since come off highs. Copper prices have again fallen for the third day in a row, reaching a two-week low as the red metal tracked overnight sentiment. Over in the oil complex, WTI (+0.1%) and Brent (+0.4%) are both in the green, with prices eyeing USD 67.00/bbl and USD 76.50/bbl to the upside respectively, with traders mindful of increases in US crude stocks as countries are importing less from Iran and storing most of what they import ahead of Iranian sanctions coming into effect at the start of November. Additionally, Saudi Arabia and Russia have agreed to extend their agreement to preserve oil market stability. Elsewhere, Sinopec and CNPC have not placed a November oil order from Iran due to concerns over how the sanctions will impact their global operation. Iraq Oil Minister Ghadhban said Iraq will help maintain a fair price for producers and consumers, adding that Iraq will cooperate with OPEC members to stabilize oil market. The highlight today will be the ECB’s monetary policy meeting and press conference. On the data front, we get Spain's September PPI, Germany's October IFO business survey, and France's 3Q total jobseekers data. In the US, it’s a busy day with: preliminary September wholesale inventories, durable goods, and capital goods orders; October’s Kansas City Fed manufacturing activity index; the latest weekly jobless claims; and September’s pending home sales, advance goods trade balance, and retail inventories. Away from data, UBS, Daimler, Twitter, Alphabet, Amazon, and Intel will release their earnings. Yet another chastening 24 hours for markets with many global equities closing at multi-month, YTD, or multi-quarter lows. The S&P 500 dropped -3.08% to its lowest level since May, and is now down -0.65% on the year. For context, it’s the fourth time that the S&P 500 has moved by +/-3% this year, after only four other instances in the preceding six years (2012-2017). Quite a remarkable stat. The NASDAQ fell -4.63%, for its second move +/-4% this year, after only two other instances over the preceding six years. We’ll see if earnings today from Google and Amazon make much difference. The DOW fell -2.41% yesterday, also undoing its gains for the year, while US banks are now down over 10% YTD after their -2.68% drop. In Europe, the STOXX 600 closed down -0.22%, though selling on futures accelerated during the US session and point to a notably lower open today. Safe havens rallied, with yields on 10-year Treasuries and Bunds falling -6.0bps and -1.3bps. The dollar, the yen, and gold all rallied, by +0.41%, +0.25%, and +0.17%, respectively. The VIX closed back above 25 up around 4.5 points. Mixed earnings were blamed for the risk-off as was weaker US housing data. Fears over the global economy were also heightened by the softer European flash PMIs earlier. The US equivalent held up a bit better but still slightly missed. More on this later but it’s worth highlighting that Asian markets are following the lead from Wall Street with the Nikkei (-3.32%), Hang Seng (-1.80%), Shanghai Comp (-1.42%) and Kospi (-1.55%) all down along with most Asian markets. In the process, the Kospi entered bear market territory today down -20.84% from its January highs as we type while the MSCI Asia Pacific index entered it yesterday - down -20.32% from its January highs. The main focus today will be on the ECB policy meeting and President Draghi’s press conference. We don’t expect any major announcements or changes to the policy stance, but expect it to be interesting nonetheless, given the recent softening in macro data and political developments in Italy. On the former point, as discussed above, PMIs yesterday in Europe softened more than expected and present downside risks to growth. Indeed, it’s possible that Mr. Draghi may reframe the risk outlook towards “to the downside” rather than “balanced.” The preliminary October composite PMI for Europe printed at 52.7 versus expectations for 53.9, down -1.4pts from September. This is the lowest print since September 2016, and indicates that some of the slowdown over the summer may not have been completely transitory. Full recap of the data follows later. On the Italy question, tensions continue to swirl between the national and European authorities. For the third consecutive session, BTPs traded strongly in the morning before retracing during the afternoon as New York awoke. Again, the rhetoric was mixed throughout the day, with European Commissioner Moscovici saying the Italian growth projections were “optimistic” and that “public debt may not come down in the next two years.” Italian Cabinet Undersecretary Giorgetti cautioned that a further sell-off in BTPs would have negative implications for Italian banks’ capital situations, and an index of Italian banks traded down -3.31% yesterday to its lowest level since November 2016. Deputy Prime Minister Salvini was not evidently sensitive the sell-off saying that “Brussels can send Italy 12 little letters from now until Dec. 25 when Santa Claus is at the door, but we will say in a respectful and polite way that the Italians come first.” Ten-year BTPs ultimately retraced gains of as much as -7.4bps to close +1.3bps higher. So between the softer data and the Italy situation, we expect Mr. Draghi to sound dovish today, but to sound firm on Italy. He will probably defer a decision on the end of QE until the December meeting, at which point the Governing Council is likely to endorse the end of QE for year-end. However, given the latest data and the ongoing Italy stress, our FX strategists have revised down their end-2018 forecast for the euro. Rather than 1.17 versus the dollar, they now expect it to trade down to 1.13. They don’t see steeper downside risk as the ECB is already priced very dovishly and the flow outlook still looks positive. Full ECB preview and updated euro call can be found here and here . Back to yesterday and trying to dissect the mixed earnings. Tesla and Boeing were the standout positive performers, but didn't outweighing tepid reports from the likes of Visa, AT&T, and UPS. Tesla posted its highest-ever quarterly revenue and only its third-ever profit, and shares rose over +8% in after-hours trading. Boeing generated a robust free cash flow and raised its profit forecasts. It provided the biggest boost to the DOW yesterday – one the only five companies to gain out of the index’s 30 members. AT&T and UPS both missed on profits and traded down -8.12% and -5.53%, respectively. After markets closed, Visa and AMD both reported. Visa missed on revenues while AMD – which had been the best-performing stock in the S&P 500 year-to-date – lowered its fourth quarter guidance and traded as much as -24% lower overnight, giving up around $5.5bn of its year-to-date market cap gain of $12.2bn. Pretty brutal reactions to earnings disappointments. The biggest data release yesterday were the flash PMIs in Europe. The euro area-wide composite index printed at 52.7 (versus expectations for 53.9), manufacturing at 52.1 (versus 53.0), and services at 53.3 (versus 54.5). For Germany, the composite index printed at 52.7 (versus 54.8), manufacturing at 52.3 (versus 53.4), and services at 53.6 (versus 55.5). In France, the composite index printed at 54.3 (versus 53.9), manufacturing at 51.2 (versus 52.4), and services at 55.6 (versus 54.7). So overall, weaker than expected, with German manufacturing new orders dipping to 48.2- its first reading below the 50-level since November 2014. Certainly not a positive signal for global demand. In the US, the composite flash PMIs showed continued expansion at 54.8 from 53.9. However the manufacturing and services numbers both slightly missed expectations even if they increased mom. Qualitatively, the report indicated strong growth and robust price pressures, with some concerns over tariffs. Separately, new home sales were down a sharp -5.5% mom in September, far exceeding expectations for -0.6%. The prior three months were all revised lower as well. The ratio of current inventory to sales, a popular metric of the housing market, rose to 7.1, its highest level since 2011, signaling a supply overhang and/or tepid demand. Our economists have been highlighting the trends weighing on US housing all year, and they don’t expect sectoral weakness to derail the broader macro strength.